6.82 points at 22 votes (rank 398). 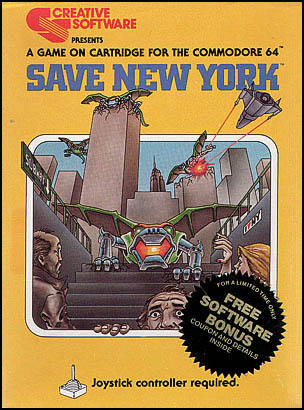 You try to protect New York from attacking aliens. The happening takes place on one screen, where there are some skyscrapers and below them underground sewers and two metro tunnels. 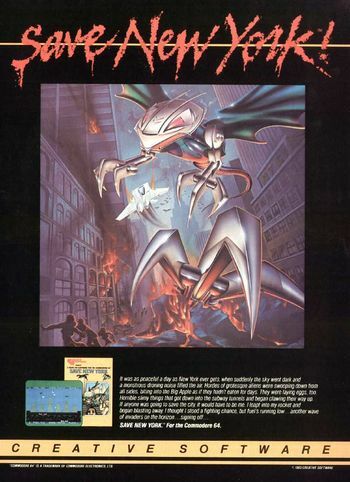 During the game some bat-like aliens appear and start to eat parts of the buildings. You now need to try to avoid this by shooting the aliens. These monsters do not move in predictable directions and it is hard to hit them or avoid them. The buildings collapse as soon as a certain amount of structure is eaten away. You also need to take care of your fuel supply and if necessary refuel your airplane in the air. For this you need to pick up the fuel canisters that the supply airplane — which every now and then flies over the city — drops down. In the higher levels the aliens thrown down eggs, out of which — if they reach the ground — a small blue aliens hatches that enters the underground. There it starts to fret the basements of the buildings and with this makes them finally collapse. 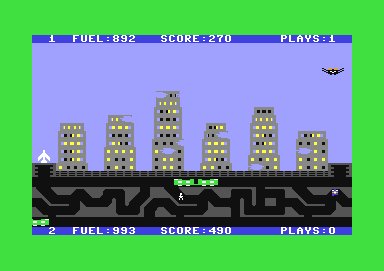 As these aliens can only be destroyed from the underground, you need to land your airplane on one of the starting ramps that are on both sides of the screen, so the pilot can get to the underground. Here you need to look out for the metro, as a touch will cost a life. The game can be played with one or two players at the same time. Player 1 (joystick in port#2) steers the white plane. Player 2 (joystick in port#1) steers the blue plane. 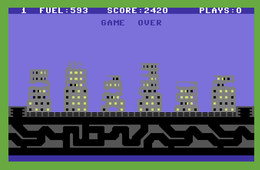 In the two-player mode both players are on the screen simultaneously. When all aliens of one level are destroyed the game is continued with a higher difficulty level. The less buildings are intact the higher the interval will be until the supply airplane appears. Obviously, this can lead to a fuel shortage. Also the number of points depends on the number of intact buildings at the end of the level. Unfortunately there is no high score list. The aircraft follows the joystick movements but is subject to the effects of gravity. RESTORE Abort the game and return to the title page. 20 points for each flying mutant hit. 50 points for shooting a mutant's egg before it hatches. 10 points for each building brick which a-mains intact at the end of each round. Player 1 up for each 1,000 points earned. You get 400 gallons of fuel each time you refuel but no points. How you can squeeze so much game into so little storage space will probably stay a secret of the programmer forever. It is a fact: A game for two players with simple graphics, no scrolling but by parting it into an air space and underground it comes with an interesting gameplay. Additionally you can play the game cooperatively or against one another. 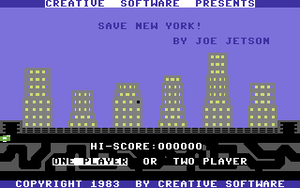 In the title screen the one- or two-player mode is chosen by joystick left/right. By pressing the fire button the game starts. The plane (also the pilot when underground) follows the joystick movements. When the joystick is pressed into the same direction for a longer time, the speed of the plane doubles (does not go for the pilot). Turnarounds with high speed make the plane "slide". It is better not to fly curves. By pressing the fire button a shot is released into the flying/walking direction. As long as the fire button is pressed, the mileage rises enormously, so only push fire for a short time. Beware: In the heat of the battle you can damage the buildings yourself. Your teammate is also not immune against your shots. RESTORE = aborts the game (back to the title screen). Take special care of the dropped alien eggs and try to destroy them before they can enter the underground. When they have entered the underground do not lose time and destroy them there as soon as possible, as they will continue eating a building until it collapses. H.T.W: "For such a small onefiler this game is very good. 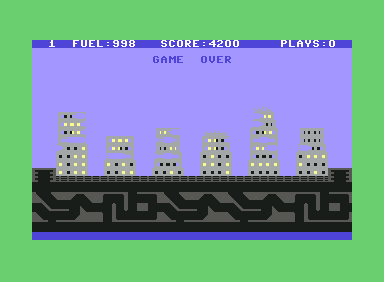 The challenge is to steer the plane inside one single screen, to concentrate on chasing the attackers and their brood and not to destroy the buildings yourself. The 2-player mode is also interesting through the "division of work". A "slightly different" but by all means funny version for 2 players is, to shoot all buildings and compete against each other. This page was last modified on 27 January 2019, at 00:57.